From The Colonial Church Chronicle and Missionary Journal, No. LXXXIII (May, 1854), pages 430-433. Hawaii: The Past, Present, and Future of its Island Kingdom: An Historical Account of the Sandwich Islands (Polynesia) by Manley Hopkins, Hawaiian Consul-General, etc. London: Longman, Green, Longman, and Roberts, 1862. From Mission Life, Vol. VI (first series), September 1, 1869, pages 535-547. "The Waiting Isles." A Sermon preached at the Farewell Service of the Mission to the Sandwich Islands, in Westminster Abbey, July 23, 1862. By the Right Rev. the Bishop of Honolulu. Honolulu: Printed at the Polynesian Office, 1863. 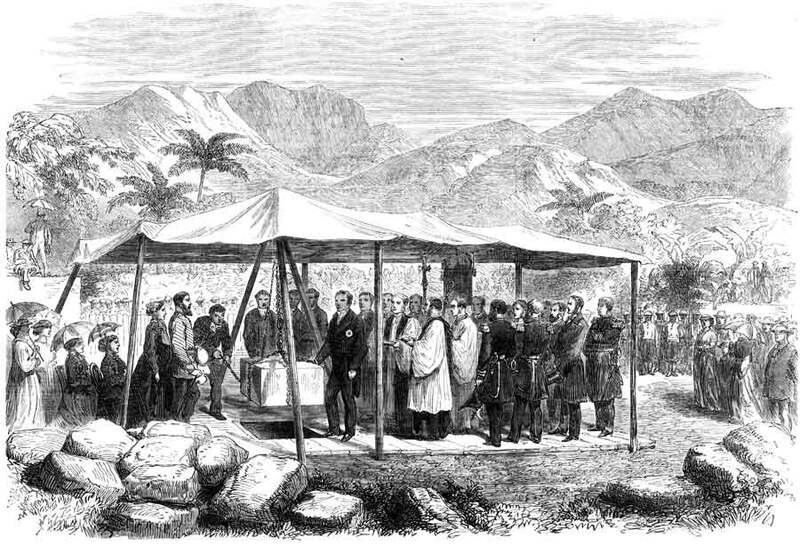 An Inaugural Sermon preached in the Temporary Cathedral of Honolulu, October 18, 1862. By the Right Rev. the Bishop of the Diocese. London: Society for the Propagation of the Gospel in Foreign parts, 1863. Delivered in his Church on New Year's day, 1865, in reply to certain mis-statements in a recent report of the American Board of Commissioners for Foreign Missions (Presbyterians and Congregationalists). Honolulu: Printed at the Hawaiian Gazette Office, 1865. From Mission Life, Vol. I (first series), September 1, 1866, pages 294-298. From Mission Life, Vol. I (first series), October 1, 1866, pages 317-323. From Mission Life, Vol. I (first series), November 1, 1866, pages 387-392. From Mission Life, Vol. I (first series) (October 1, 1866), pages 311-317. The Cathedral at Honolulu, and the King of the Sandwich Islands. From The Illustrated London News, June 8, 1867, pages 559-560. From Mission Life, Vol. IV (Jan. 1, 1869), page 14. From Mission Life, Vol. IV (February 1, 1869), pages 82-84. From Mission Life, Vol. VI (March 1, 1869), pages 135-142. From Mission Life, Vol. III, Part II (New Series), London, 1872, pages 644-646. Excerpted from Mission Life, Volume IV (1873), pages 218-225. From Mission Life, Vol. V (1874), pages 601-605. A Letter from the Right Rev. Alfred Willis, Bishop of Honolulu, to All Friends of the Hawaiian Mission and a Balance Sheet of Accounts for the Years 1874, 1875, and Part of 1876. The Church in Hawaii: The Bishop of Honolulu's Letter on the Affairs of the Mission, with List of Subscribers and Statements of Account, for the Year Ending 30th September, 1881. A Correspondence from Members of the English-speaking Congregation of St. Andrew’s Cathedral, Honolulu. The Principles of Government of the Anglican Church in Hawaii, traced to their source, for the settlement of certain controverted questions; to which is added a review of the present position of the Anglican Church in the Kingdom of Hawaii. Published by request of His Majesty King Kalakaua. How Annexation Affects the Anglican Church in Hawaii. A Pastoral Letter from the Bishop of Honolulu, 1898. Sequel to "Two Letters re the Anglican Church in Hawaii." An Open Letter from the Bishop of Honolulu to the Chairman of the House of Bishops of the Protestant Episcopal Church in the United States. Honolulu: The Mercantile Printing Co., 1902. What the Church Has Done for a Chinese Layman in Honolulu. Eighteenth Annual Report of the Honolulu Seamen's Institute. Honolulu: Honolulu Seamen's Institute, 1921. New York: The National Council of the Protestant Episcopal Church, Department of Missions, 1927. [Honolulu] Printed by W.W. Ahana Print. Co., 1936.